Peter Mbuvi lost his leg when he was attacked four times by a 7,000-pound hippopotamus at a popular lake in Kenya. Due to a massive infection, doctors amputated his mangled leg. Until the LIMBS team fitted the 27-year-old victim with a custom prosthetic limb containing the LIMBS Relief Knee, all he had was a crutch to move around on. Peter now leads a happy and productive life. In 2010, he got married to his beautiful wife, Rebecca, and now they have a rambunctious two-year-old son, Kelvin. Peter works as a contract worker for the government doing construction jobs. He is currently building a community toilet near a local meeting area near his home. In his spare time, Peter tends a small garden plot and grows vegetables to supplement his income. 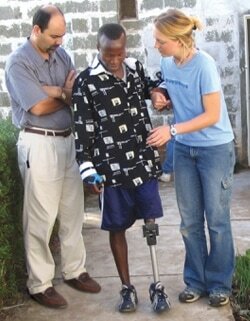 He is on his feet most of the day and unless he wears shorts, you can barely tell that he wears prosthesis.